Innovation is playing an important role in the world we are living today. Everyday new changes and challenges. Every single child knows what facebook and social media is. Innovation leading to success has made a huge change not only at lower or intermediary level but at higher levels as well. Communication facilities with only one touch made a real change to every single internet user. Buying, selling, moving, dancing, playing, and much more being done online. Regarding transportation and innovation, there are many user friendly websites for instance https://hicabs.com.mt/ in Malta is amongst the best cab and taxi Malta service, making people’s commuting life easy within seconds. This particular company uses the latest communication method for bookings, and it really showed at what point internet changes peoples life. Today in 2017, being served with only one touch, is something marvellous, saving you time and effort, so you can focus on what is important to you. Businesses today often need a bit of help moving their bottom line forward. Staying with the old version, there would have never been the iPhone 7 today, where even Samsung is trying its best to continue to bring new models out. It is no secret that anything mobile is all the rage today. By using mobile applications such as: https://play.google.com/store/apps/details?id=com.hicabs.habsapp&hl=en will ease almost everyone within seconds as nowadays everyone is too busy to stay calling for a cab or taxi. The popularity of the use of cabs has been growing steadily in the past few years. Literally HiCabs Malta is bringing new concepts, awesome ideas making transportation industry more efficient, safer and profitable. Be it Airport transfers, emergency, touristic tour, educational tour or work related transfers, hicabs is ready via its APP, website booking page or through a single phone call on (+356) 2137 2137. Any reviews or queries, just email on [email protected] Travel from north, south, east or west, hicabs Malta is the best. Events In Malta Although a small island of just over 400,000 inhabitants, Malta’s year is jam packed with a wide variety of events. Our summers are especially famous for ‘festas’, a weeklong celebration of the village patron saint, however, over the years Malta has had some spectacular yearly events, each one attracting thousands of visitors. Birgufest (ex Birgu by candlelight) Imagine an old city with beautiful architecture, completely lit up by candles. The city of Birgu takes you back to the times with no electricity and really captures what it feels like to live in olden times. The thousands of candles that light the street not only take you back in time, but also create a unique romantic atmosphere, hard to replicate anywhere else in the world! The event organizers take it a step further and in true typical Maltese culture introduced a healthy amount of food too. Stalls along the streets serve up tasty local treats that complement the atmosphere perfectly. Historical re-enactments have also recently been introduced, so don’t be surprised if while you’re eating a delicious ‘hobz biz zejt’, a small army suddenly emerges and marches towards you! It is also worth mentioning that on the day, various museums open up and offer discounted rates… Definitely not to be missed (Date; beginning of October) Notte Bianca Introducing Birgufest’s older (and larger) sibling, Notte Bianca. This is one of Malta’s most popular cultural event with over 70,000 people attending the event. Valletta, Malta’s capital city, is lit up with spectacular visual displays from the front gate, so the last road on the peninsula. Events within this events are varied and cater for all ages and taste… Party; Valletta has numerous squares and forts. One doesn’t often get to party in an ancient fort or in the middle of a medieval city… no expenses are spared when preparing for these partys! Dance; Apart from street dancers positions in different areas along the streets, one or two of valletta’s magical gardens are also taken over by dance crews who not only entertain the crows with beautiful dance routines, but also carry out workshops for those present. Food; Naturally, there was going to be food at a Maltese super event… lots of it. The streets are lined up with food stalls, sorted by cuisines. There isn’t much to say except that you definitely won’t end your night with an empty stomach, the smell of food is a temptation that is hard to fight off for too long! History; Apart from re-enactments all over the city, museums stay open late and also offer discounted prices. For anyone who is interested in Malta’s rich history, the evenings offer the perfect opportunity to walk through every museum in a single evening and get a glimpse of how the beautiful island came to be. Musicians will also be present throughout the city performing a variety of shows from maltese folklore music to modern hits. And to top it all off, during this year’s 10th anniversary there were acrobats perform gravity defying routines. Carnival Carnival is February’s most popular event on the Maltese islands. Carnival enthusiasts spend long hours every week, starting from sever months before the event actually arrives, preparing large coloured floats and elaborate costumes. The event’s main venue is Valletta where all the floats are paraded and compete against each other to win the yearly prestigious award of best float. It is not only those participating in events who take carnival seriously. The majority of those going to Valletta during carnival also dress up and although not participating directly, definitely help create a unique atmosphere. Another event that has become popular over the years is carnival in Nadur, Gozo. Thousands of Maltese youths flock over to the tiny island to celebrate and spend a weekend with friends. The Nadur festivities see some of the most grotesque, scary and outrageous costumes that you would generally not find in Malta. For anyone looking for something slightly different than the norm, this is not to be missed! 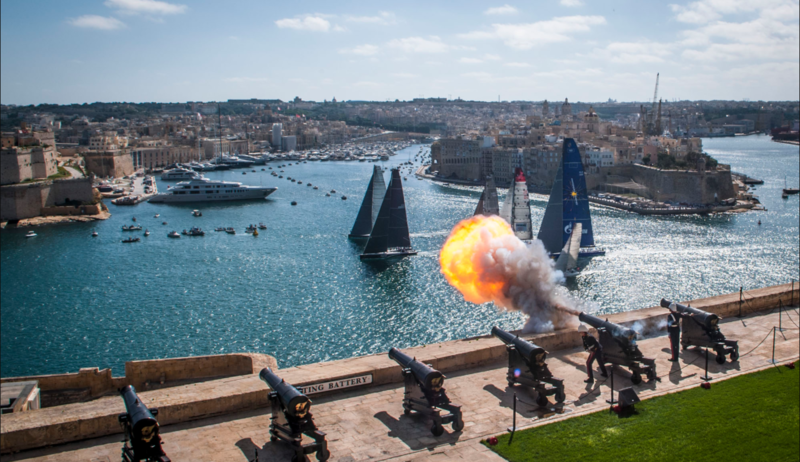 Rolex Middle Sea Race Being an island, with Europe’s largest natural ports, it comes as no surprise that Malta is the hose of the world famous Roles Middle Sea yachting race. The race itself takes off and finishes in the magnificent grand harbour. Yachts from all over the globe compete in the 606-mile race from Malta to Sicily and back. High profile boats from the world’s top designers take part in this annual event. Last year’s event saw the highest number of yachts competing, 122 in all. The start of the race can be viewed from several places around the harbour and the views are truly breath taking. The event is a photographers dream as they capture beautiful shots of super yachts. Isle of MTV Snoop Dogg, Lady Gaga, David Guetta, Black Eyed Peas, Jessy J, Flo Rida… all performing in the same venue, during the same evening… and there’s no entrance fee too. This event has become an annual gathering of over 50,000 people! It offers a unique opportunity to enjoy some of the world’s biggest artists at a go.